Before the arrival of cane sugar in Europe, parsnips were used as a sweetener for jams and cakes. Once sugar was introduced along with potatoes, some countries were pretty quick to relegate them to the category of cattle fodder. But the Brits kept them on as a significant commercial crop, and they are still one of the joys of winter: sweet, cheap and easy to cook. Parsnips are also slow to grow, which is good because their best flavour comes once we’ve had a few hard frosts – these unquestionably improve their sweetness, as part of the starch converts to sugar. Parsnips have soft, porous skins and lose moisture faster than most other root veg. It’s best to leave the mud on as a protective coat. Store them somewhere cool and dark, or in a paper bag in the bottom of the fridge, and they’ll keep for a good 2–3 weeks. 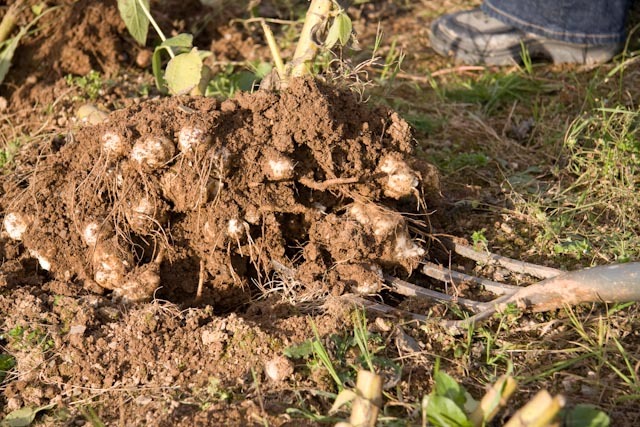 Usually you can use the whole vegetable, though late in the season (late February) the core might start getting a little tough, in which case quarter the parsnip lengthways and cut it out. Skordalia is a Greek side dish of potatoes and garlic whipped into a dip, thickened with stale bread or nuts and spiked with lemon. This parsnip version is good warm with lamb or mushrooms, or at room temperature as a dip for pitta bread. Parsnips are less likely to go gluey than potatoes when blended. The pungency of raw garlic is all part of the appeal in the original dish, but we recommend you add it a little at a time and taste. Put the parsnips into a pan with the bay leaf and cover with the milk. Bring gently to the boil and simmer for 15–20 minutes, until very soft. Strain the parsnips, reserving the milk. Put the parsnips into a food processor with a dash of the milk and blend until smooth. Add the breadcrumbs, almonds and half the garlic and blend while adding the olive oil in a steady stream. Add half the lemon juice and a good pinch of salt. Check the seasoning and add more garlic, lemon juice and salt as you wish. If the mix is stiffer than you want, add a little more of the warm milk to loosen it. * This dish can be warmed up with a little bit of spice. A clove or two added to the milk when you cook the parsnips works well (remove before you blend), as does a teaspoon of freshly ground cumin. * If the punch of raw garlic is too much for you, take the edge off by adding the peeled garlic cloves to the milk and simmering them with the parsnips. * Replace the almonds with toasted and skinned hazelnuts. Put the parsnips in a baking dish and toss in just enough oil to coat. Season well. Roast at 190˚C for 45 mins-1 hour, until tender and browned (caramelised bits are a good thing with parsnips). Put the tamarind paste in a small heatproof bowl. Pour over 2 tbsp boiling water and leave for 15 mins. Meanwhile, put the fennel and coriander seeds in a small dry pan. Heat gently for a min or two, until you can just smell them, then grind in a pestle and mortar. Sieve the tamarind mixture and put the drained liquid in a small saucepan. Add the ground seeds, dates, chilli, ginger and 250ml water. Bring to the boil, reduce the heat and bubble for 10 mins. Blitz in a blender until smooth. Squeeze some lime juice over the parsnips, then drizzle with the dressing. You can keep any leftover dressing in the fridge or freeze it. Heat the oven to 200°C/Gas 6. Toss the parsnips with salt, pepper and about a tablespoon of the oil. Spread over an oven tray and roast for about 40 minutes, until soft and beginning to caramelise. Remove, allow to cool then roughly chop. While the parsnips are roasting, boil the potatoes in salted water until soft, about 20 minutes. Drain well and mash while warm. Keep your mash as dry as possible so that the cakes hold together; if it seems wet stir it over a low heat for a few minutes. Cook the sprouts in plenty of salted boiling water until tender, about 5 minutes. Drain well and cut into quarters. Fry the bacon over a medium–high heat with a drizzle of oil in a large frying pan (preferably non-stick) until really crispy. Remove with a slotted spoon and drain on kitchen paper. Keep the oil left in the pan to fry the cakes. Mix all the veg with the bacon and season with salt and pepper. Dust your hands with flour then mould the mixture into burgersized patties. Add the remaining oil to the frying pan, place over a medium heat and fry the cakes in batches until they are golden brown, about 5 minutes per side. Add more oil to the pan if you need it. If the first cakes have cooled down by the time you have fried the last, you can reheat them all in the oven for 5–10 minutes, until piping hot. Good on its own, or serve with greens and crusty bread for a vegetarian supper. It works well as a side for pork too. Preheat your oven to 180˚C/160˚C fan/gas 4. Lightly grease a medium sized gratin/baking dish with a little butter. Put the milk, cream, garlic and thyme leaves in a pan. Grate in a little fresh nutmeg, then warm gently. Layer the parsnips in the baking dish. Stir the mustard into the warm milk mixture. Season with salt and pepper, then pour over the parsnips. Cover tightly with foil and bake for 1 hour. Uncover, sprinkle over the cheese and breadcrumbs, then bake for approx 15 mins until golden. Grease an 18cm round cake tin with a little oil on a piece of kitchen paper. Line it with baking parchment. Put the eggs and sugar in a large bowl and beat until thick and creamy (a hand held mixer really helps). Gradually whisk in the oil. Fold in the rest of the ingredients. Transfer the mixture to the tin and level it gently with your wooden spoon. Bake at 190˚C for 30-35 mins, until cooked through. Remove from the oven and leave to cool in the tin. 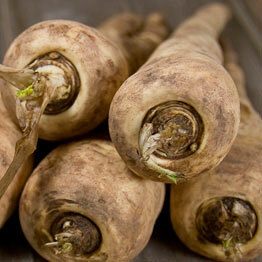 Visit the recipe pages on our website for further recipes, or add organic parsnips to your order.